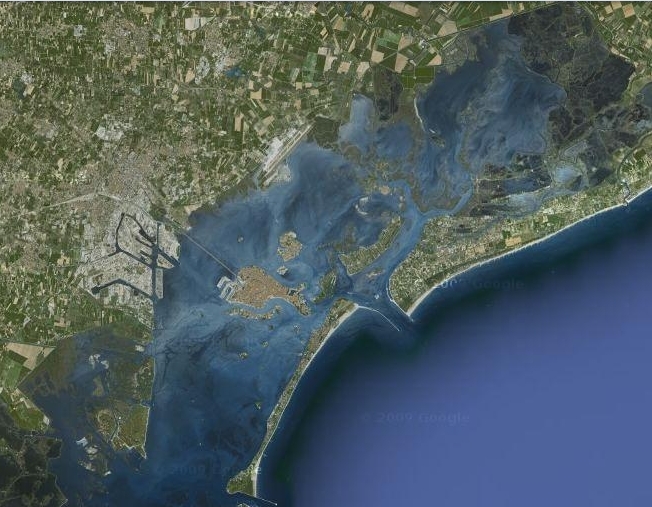 I last spent time in La Serenissima about thirty years ago. How time … [insert cliche here.] I was on my way to India via the land route, and stopped for a week or so, drunk with architecture. It was September, and I thought that the high tourist season would be over by then, but I was wrong. I spent my first night on the Lido beach, I recall. The sight of boats laden with tourists gliding through the dark, surrounded by crowded walkways, reminded me of Disneyland, but I knew why I was there. 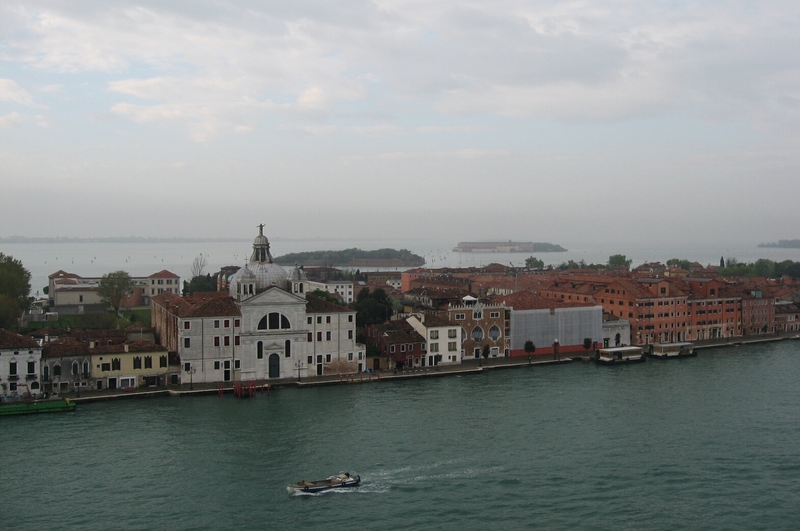 With daylight, I found my way to the Giudecca, the Jews’ island, where the International Youth Hostel was. I ate for free during the several days of the Festival of Unity staged by the Communist Party – delicious. The irony was tasty too – I am neither an observant Jew nor a communist. 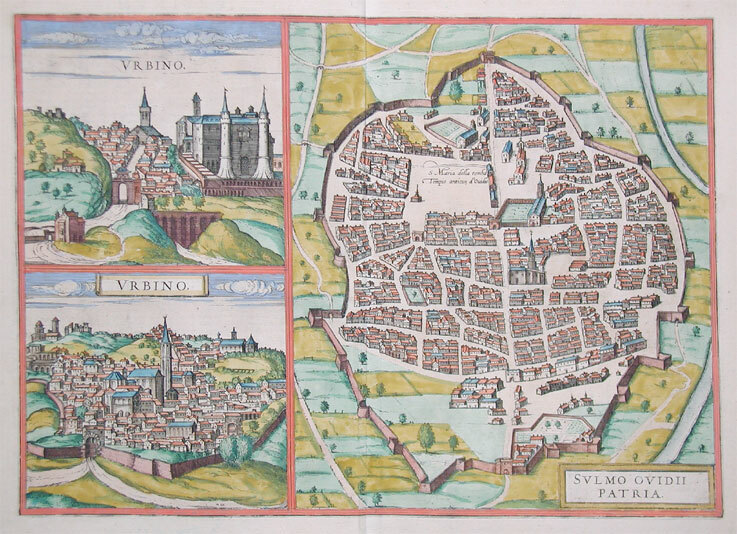 Moreover, the Jewish ghetto of Venice was never located on that island, which is home to one of the great Renaissance monuments, the church of Il Redentore by Palladio. 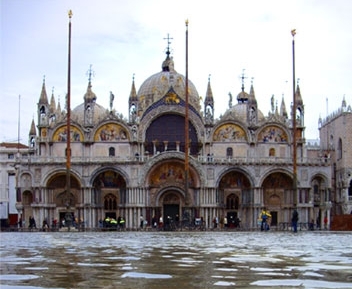 Venice seems to have a special place in the imagination of Europeans, even Italians, as well as tourist hordes worldwide, and it is featured in films often. Two films I like very much that feature Venice are Italian for Beginners and Bread and Tulips, one Danish, one Italian, both romantic comedies. Then there are the films I don’t like, and films I thought were great but that I’m too scared to watch again. 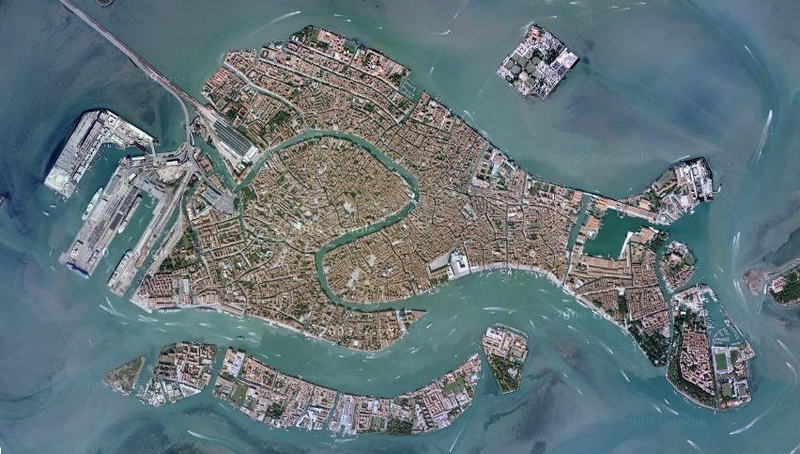 When I was studying the history of architecture, a grad student told me that “everyone loves Venice.” That is, all architects and planners, regardless of their stylistic bent or ideology (and the latter can be pretty fierce among architects – intensity seems inversely proportioned to the number of completed projects…) all point to the city of Venice as the exemplar of whatever they hold most dear. It is often cited as a supreme example of “organic” urban growth, and indeed, from the air, it looks sort of like a schematic fish! I have always thought the Grand Canal, snaking through it, looks like the main intestinal tract in higher animals, and once again, that is, sort of, what it is for the city as a whole. Now, the city is a fossil, without an economy independent of tourism, although we shouldn’t despise it for that since in our “spectacular age,” tourism is an industry like any other. The sinking has stopped with the cessation of pumping in Mestre and other places, but high water, as always, is a problem. The flood gates are under design to preserve the physical fabric of the place from inundation, but the lower stories of many structures, already sunken to the point that portions are permanently submerged while they were designed for occasional flooding, are crumbling and need shoring up. I don’t really care – the city is a physical creation unlike any other in the world and should be appreciated for that beyond all else. It is a monument to the amazing creativity of the urban collective, and it provides an ideal point against which to measure any urban fantasy, because it was as real as real can be for centuries. Pity it, laugh at its not-too-clean canals, dismiss it as a decaying urban theme park: what city can claim to have been so powerful, so rich, so influential, and so fantastically beautiful in a way unmatched by anyplace on earth for so long? Kevin Lynch’s book, The Image of the City, is an investigation of how inhabitants of urban areas form an image in their minds of the city, and the implications of this for ‘urban design.’ The book is a classic, endlessly cited. I have been thinking a lot lately about cities and urban sprawl, and I am wondering if our image of the city isn’t a big part of the problem when we start diagnosing and ranting about urban ills of today. Many of us come to the city with a notion of what a city should be that is woefully out of date, and has nothing to do with the cities in which we live. A true believer in the Lynch point of view, at least as I understood it as a student long ago, would say that people today have no clear idea of the cities in which they live because the urban form has spread, “metastisized,” sprawled, bled all over, etc. etc. the surronding area and that cities have no form, are formless, today. Of course, everything has a form. Maybe not the one you like… The conclusion is that something is terribly wrong in everywhere-ville today. 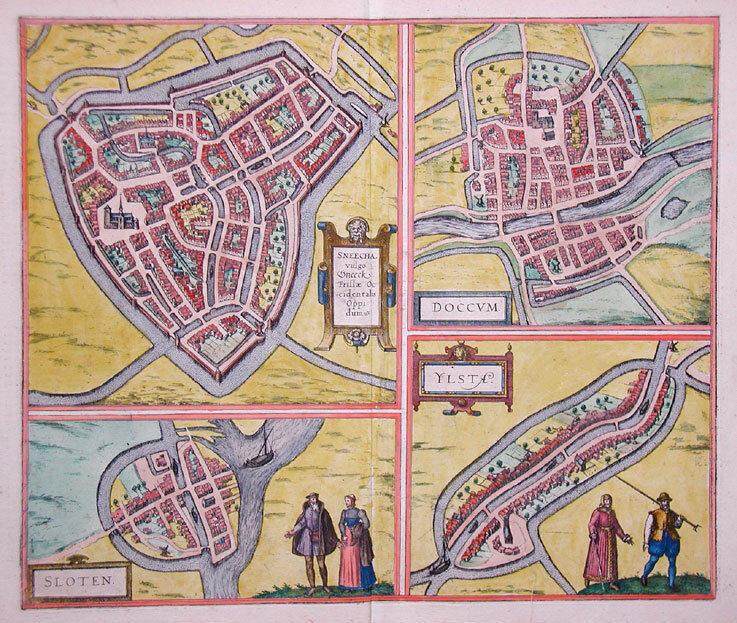 Cities of the World – the complete color plates from 1572 – 1617 by Georg Braun and Franz Hogenberg. 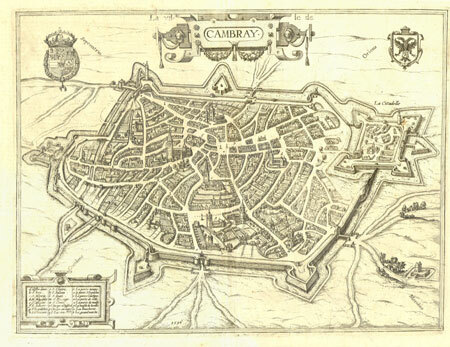 This was, perhaps, the golden age of city form, or at least of idealized versions of it committed to paper. Looking through this book is a dizzying experience for anyone who is interested in urban history and European architectural tourism! The plates are positively awe inspiring in their beauty. They convey a powerful, nostalgic, and completely inappropriate way of looking at cities of today. But who cares! Here are some good cities! They all are so clearly demarcated from the surrounding country. They give such a clear sense of their structure and ordering principles. Their enclosure by walls or moats makes them look like biological cells, prompting all sorts of fertile notions about urban growth, organic growth, sustainability, city-nature, etc. Of course, this was a picture book. 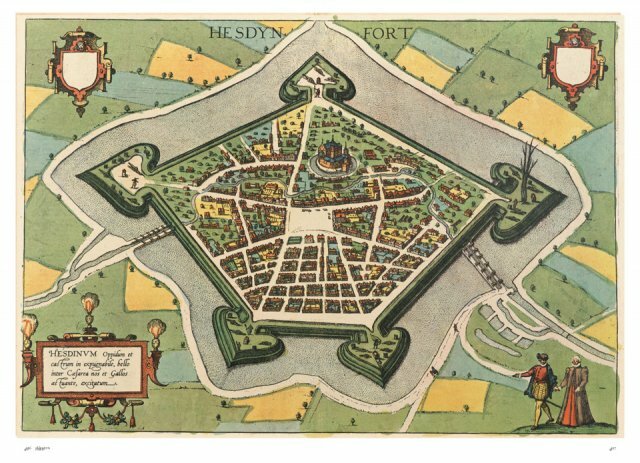 Did the cities ever look quite like this? To a great extent, yes, but any unsightly details such as squatters or gypsies, industrial outbuildings crowded up against the edge, and the like, were removed. 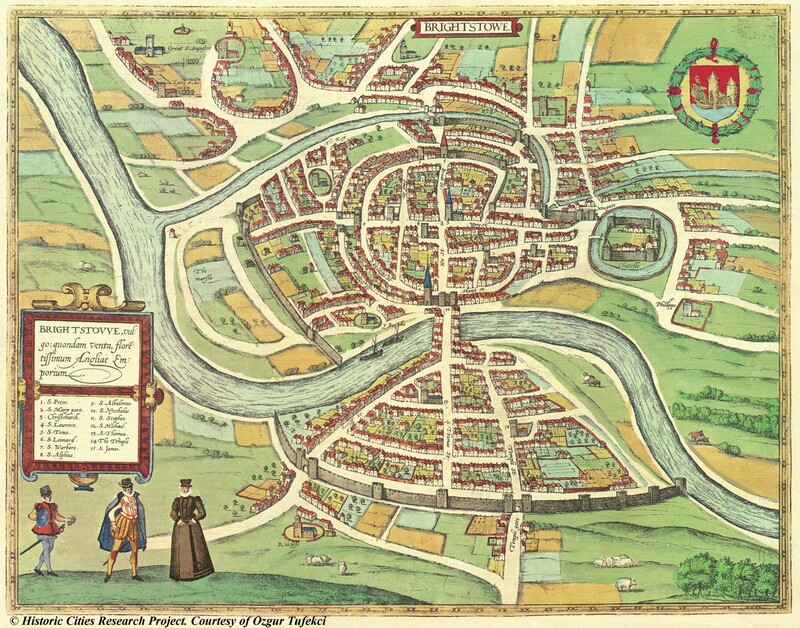 This IS the image of the city we carry with us, at least those of us who have been properly educated, as I was. 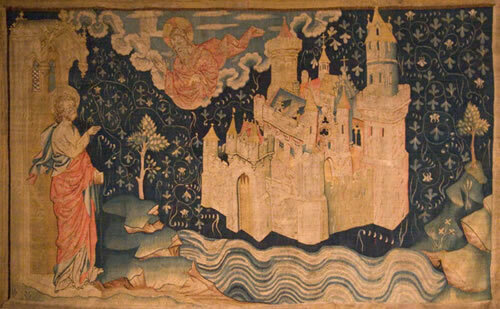 The image has many sources, not the least of which are religious, as shown here in this scene from 14th century tapestry in which John views the Celestial Jerusalem. 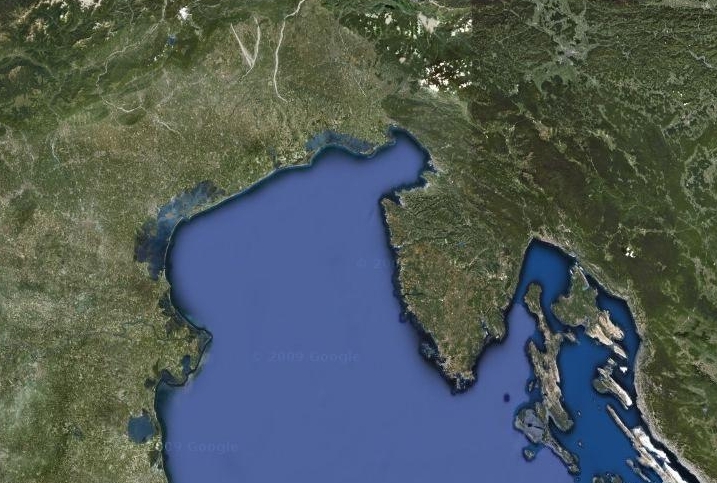 Of course, there’s also Homer, in which the walls of Troy are for viewing the fighting going on in the plain below. In his wonderful book, Sprawl: A Compact History, (clever, that compact bit) Robert Bruegmann challenges a lot of these notions. Sprawl, suburbs and suburbanization, development, edge-cities, exurbanity, and all that are the antithesis of the city. Or so we think. He argues, convincingly, and on the contrary, that there has always been sprawl, but that it was always the preserve of the economic and power elite. Today, sprawl, or low-density urban living, has been democratized. In his book, he doesn’t really evaluate sprawl as good or bad, except to say that it clearly has many good consequences and many that are not good. This neutral approach infuriates some people who seem to feel that not declaring war on sprawl at the outset puts him in league with the devil, or at least with the Republicans. Bruegmann feels that sprawl, and the cities with which it forms urban systems is too complex to yield to simple analyses: first we must understand the history and nature of what we are ranting about. Over and over again he marshals facts and logic to challenge, and sometimes demolish the pretensions of the anti-sprawl contingent, and a few of my preconceptions fell by the wayside in the process. As I read through his book, it seemed to me that sprawl and global warming have much in common as causes – indeed many would join them in some way – in that they have a religious significance for many people. To investigate scientifically is to violate sacred taboos. Perhaps my favorite moment in reading was when he remarked on the monumental lack of curiosity regarding the reality of modern city life present in the writing of Lewis Mumford, a veritable god to me in my younger days. Well, I still like Mummy’s prose – readers of this blog will be familiar with my weakness for apocalyptic cultural and political critiques – but the fact is, he’s right. I wonder, did Mumford ever speak to someone who liked living in the suburbs? The other night, I caught the tail end of a special on the The History Channel called “The Sewers of London.” Wow, that must have drawn quite an audience…but I was watching. It described the horrors of cholera and typhus in London before the scientists had sorted out the causes of these scourges. The miasma theory (infection borne by odor) which was wrong, but which nevertheless motivated great public works that led to spectacular gains in public health, dominated the medical establishment. The Great Stink of the the mid-19th century in London arose from raw sewage dumped right into the Thames, the source of the city’s drinking water. The theory of water-borne disease was not accepted, and Pasteur’s germ theory was not developed yet. 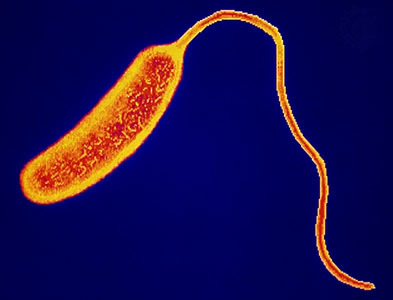 Get the stink away and the cholera will leave – it was common sense! Enter Mr. Bazelgette, heroic engineer of the Victorian Age. (Alas, we have these giants no more!) He built a huge gravity drainage system that directed the city’s sanitary waste to two large pumping stations, from which it was lifted into giant holding reservoirs. (They must have been a frightful sight when full!) When the tide on the Thames was going out to sea, the reservoirs were emptied into the river, and the sewage was carried downstream, away from the city. 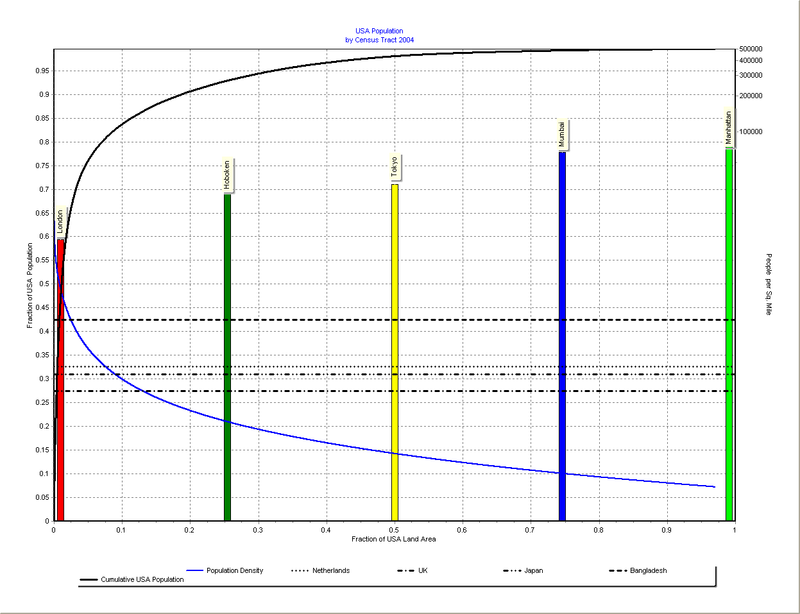 “The solution to pollution is dilution,” as they say in the engineering world. Today, the beautiful Thames Embankment, imitated the world over, including in New York City’s Battery Park developments, sits on top of the massive gravity sewers designed by Mr. B. Around the same time, Doctor Snow made his famous map, dear to epidemiologists and cartographers, that showed the incidence of cholera in a neighborhood he studied. He inferred correctly that the cases were all linked to the source of their drinking water, a local pump. To test his notion, he dared to remove the handle (take note, Mr. Dylan) and the frequency of cholera deaths in the area dropped suddenly. Case closed! Disease is carried by…something…in the water, not by smell! 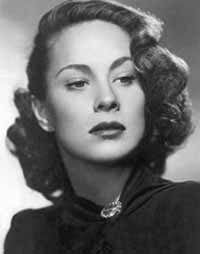 Which brings us to Alida Valli, the woman at the head of this post, the love interest of Harry Lyme (Orson Welles) who meets his ignominious end in the sewers of post-war Vienna in Carol Reed’s film The Third Man. I heard about this film from my mother, at a very young, formative age. Was I, perhaps, conditioned by what Pynchon calls the “Mother Conspiracy, ” just as poor Slothrop was? Is that why I now make my living fiddling with drainage systems and subterranean infrastructure? Well, leaving aside my hydraulic-psychoanalytics(and Freud was, I recall, very fond of hydraulic metaphors) it’s a great film. And if you think I’m the only one who spins strange associations off of this film, read this appreciation of Ms. Valli. I recently saw Valli in another film, Hitchcock’s The Paradine Case, a not-so-great film in which she plays a wonderful femme fatale. Yep, she did it, she get’s hanged. The film’s location shot of the court struck me as it showed the corner blasted away from a bombing raid – it was shot in 1947. There are other items I’m sure…send me your finds! …perhaps we would concentrate our citizens there and leave the rest of the continent as a garden. 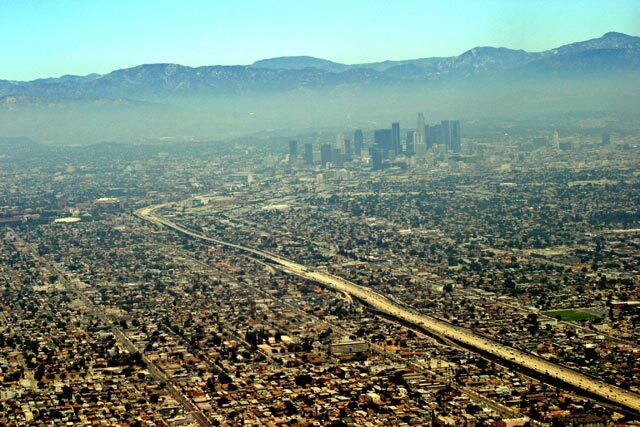 Even in those diseased parts of the nation that are highly urban, the density is not nearly so great as what is common in the rest of the world. Consider this next map of the metro area around New York City. The blue curve refers to the right axis, and shows that 90% of the land is settled at densities so low that they barely register on the axis. 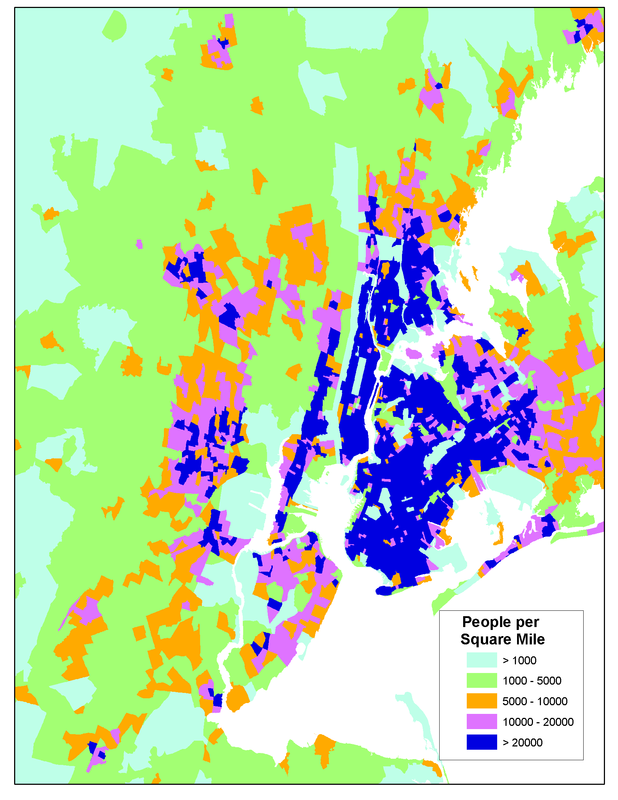 Manhattan, our most densely populated place, is only twice as dense as ALL of Bangladesh. If you factor in Brooklyn, Queens, Bronx, and Staten Island, NY City is about as dense as ALL of Japan. Many world cities are much denser than American ones as few cities in the USA even approach the density of NYC, let alone Manhattan! The horizontal dashed lines show the densities of some modernized countries – clearly people are crammed in – comfortably from what I’ve seen and heard – at rates that far exceed what we have here in the USA. So, if we want to pave over the USA and have everyone live in a McMansion, then maybe we should cut back on our immigration and population growth. If we want to use resources wisely, I don’t see anything to worry about. 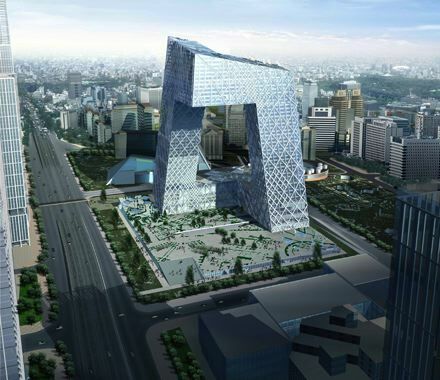 What’s up with this building of the Chinese State TV headquarters now going up in Beijing? It’s designed by Rem Koolhaas, shown here in a presentation drawing. Is it a Moebius strip? I can’t decide whether it’s some kind of wonderful or a vision from the hell of 1984. I don’t like to pass judgments about buildings I’ve never seen, but this one does give me the creeps. I can imagine the minions of the state propaganda apparatus having a fine old time inside trying to control the minds of the nation. And they say it is the largest office building in the world next to the US Pentagon. 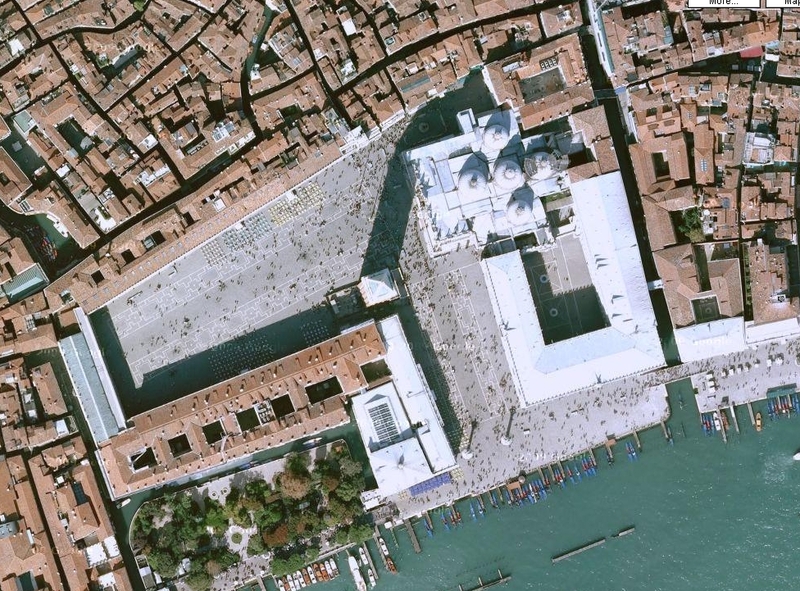 Talk about human scale…which is something that Koolhaas does talk about. We’ve got the Chinese TV headquarters under construction, then two shots of the late, great twin towers. I know it’s heresy to say this, but I think that they destroyed the skyline of Manhattan. Quite honestly, I hated them and found them to be soulless, overpowering buildings set in a windy plaza above a depressing subterranean shopping mall. Now I look down from my window and watch their successors take form. Next up, Le Corbusier’s vision for Paris – knock down the buildings and set up rows of cruciform skyscrapers. The street must die! It’s so noisy, chaotic, and…lacking in ORDER! (Jane Jacobs knew where he was coming from.) Corbu’s vision was realized in part in NYC in Cooper Village and Stuyvesant town, two mega developments that provided a lot of low-cost living space to WWII veterans coming home. The towers are dull, even ugly, and set in a rather boring and uninspired “park” setting which is, however, lovingly, even lushly tended. A saving grace…Now the subsidies are gone and the apartment rents and prices are through the roof. Some visionary stuff a la Francaise. Claude Ledoux’s spherical house, pure geometry, but not overly large. Still, what’s the point of living in that other than to prove an artist’s point? And the Great Arch of La Defense, located on the edge of Paris. Another exercise in pure form – lovely isn’t it? Nearby, the National Library, in the shape of an open book. Nevermind that functionally it is a failure, i.e., it doesn’t store books very well. Next up, two images of the Empire State Plaza in Albany, New York, the capital of New York state. “Empire State” is the nickname of New York (thus the Empire State Building…) but it seems a bit ironic here. A plaza in the capital of a state ruled by democracy, named “empire,” and in a style that would seem at home in an evil empire anywhere, cinematic, soviet, futuristic fascist, and the like. It was built by Nelson Rockefeller, a man not known for his humility. The huge reflecting pool on the left has a pavilion at the end that seems like an imperial Persian review stand on steroids. And that weird floating thing on the right in the middle picture? That’s a theater, not a cast-off from The Jetsons. The last picture on the row, a shot of Brasilia, carries on the theme with a little more elegance. Closing out, we have some fantastic visions – never built, of course, but today..? – by Etienne Boullee. A pryamid a la modern, an enormous, cavernous, seemlingly infinite design for a national library, and a monument to Issac Newton. The latter at least makes a nice match of over the top design with the size Newton’s ego, his subject, and his accomplishments as well. The criminals are sadistic and brutal, but they are human after all. They take calls from their kids and their parents while they are “working.” One of them wants to be an artist. Another is a bit of a thinker – he tells the woman victim that, yes, everyone gets robbed, but only the ones who “flaunt” their wealth get treated with such hatred. The police are corrupt and criminal themselves. The opening credit sequence of the film includes an aerial pan over the city showing images like the one above, and I think this one in particular encapsulates the idea behind the film. 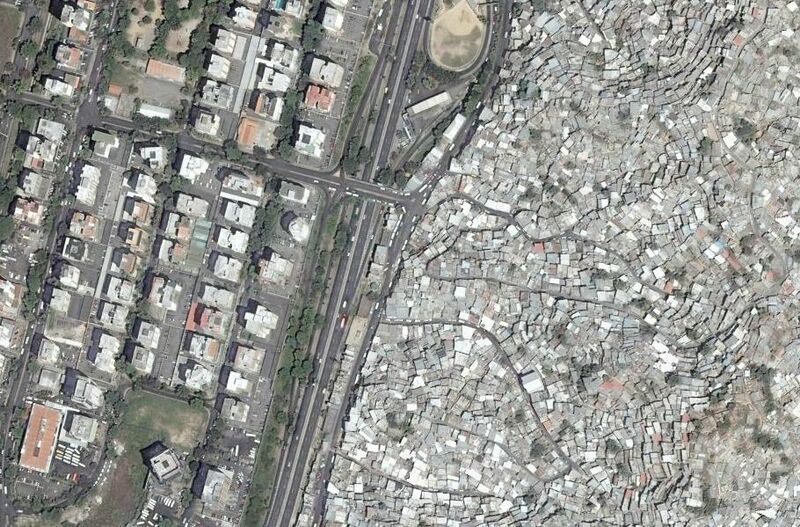 On the right, the sprawling, unplanned, crowded, ramshackle ghetto covering the hills that surround the city. On the left, the ordered, geometrical, spacious, flatlands of where the city of civil society, capitalism, and affluence is placed. [Unlike the USA, in Latin American cities, the well-to-do live in the center, the poor live in the outlying hills.] Two cities, two geographies, two terrains, both economically, socially, morally, medically…on and on. Can a society be a society and live this way? The officer, who wrongly assumed Belgrade’s street addresses were numbered as uniformly as, say, Manhattan’s, ended up targeting the Chinese Embassy, which is on a frontage road nearly 1,000 feet from the supply directorate that was the intended target, the officials said. Ah, maps in the news. Lines in the sand, between Kuwait and Iraq: Where is that line? An Italian lawsuit against the US Air Force hinges on whether maps the pilot used showed the ski lift cables that his plane sliced through, sending people plunging to their deaths. Here in the land of the grid, addresses are usually pretty logical. 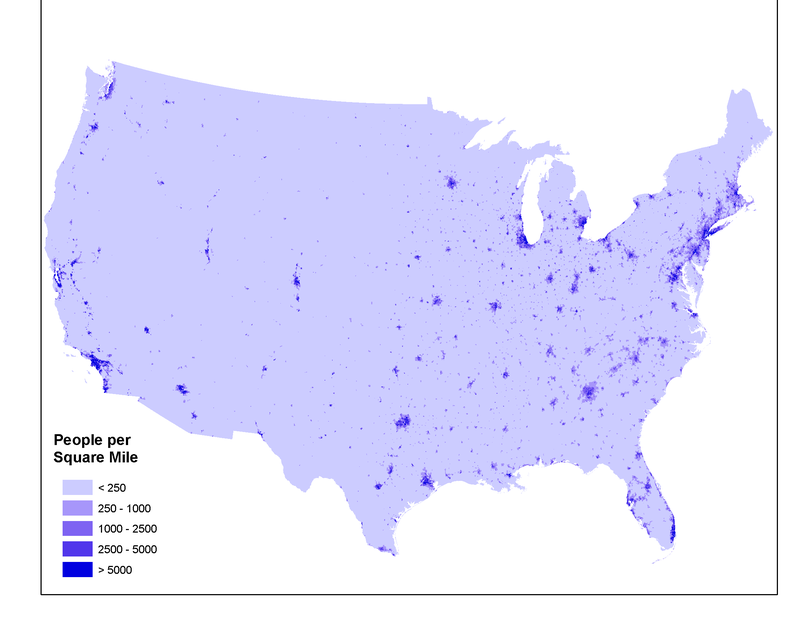 As long as you are in a city in the USA, chances are likely that most of it is on the grid plan. (The ‘burbs are another matter.) 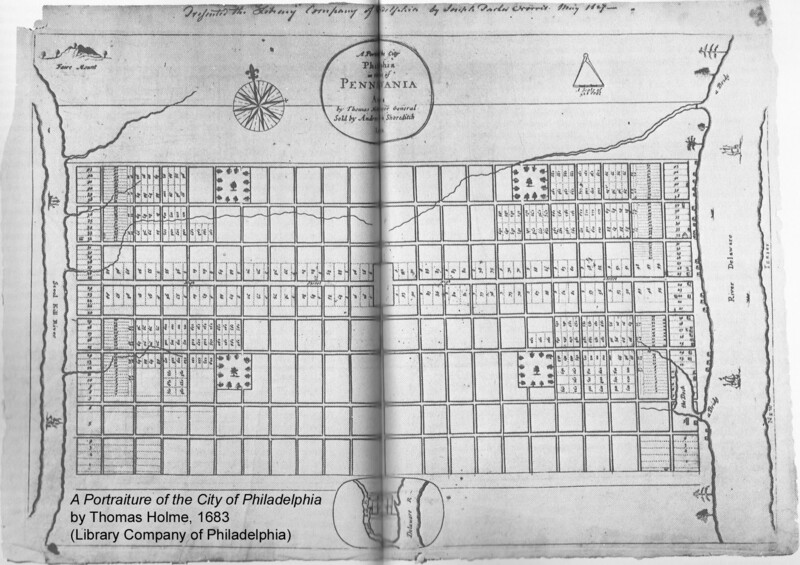 Manhattan is only the most well known of these orthogonal street plans – this one is from Philadelphia. Not all cities in the world have such well ordered postal address systems. Slums, shantytowns, favelas…don’t, and lots of people live there. Japanese cities do not have regular numerical addresses either. 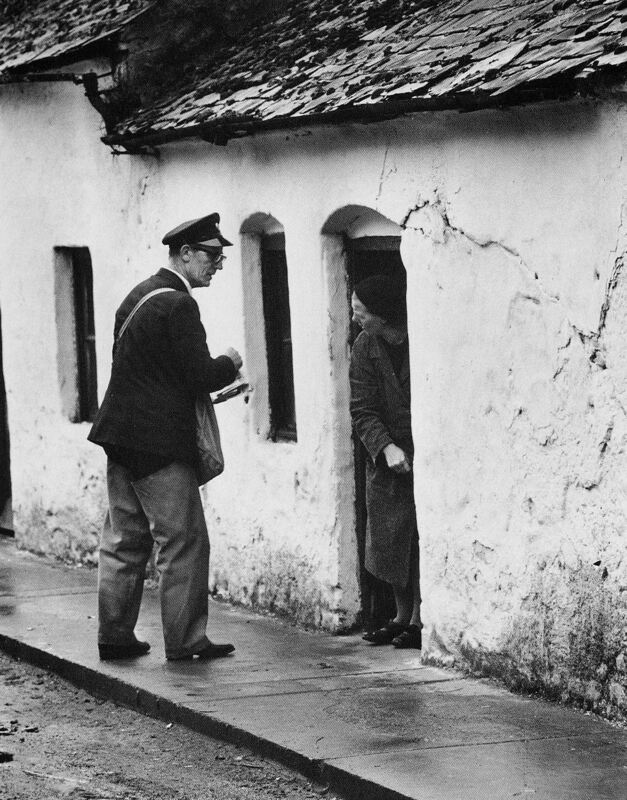 Postmen must memorize the sequence of addresses in their entire route – they follow no clear or logical order. How does one give directions – by landmark, I guess. A colleague of mine wonders whether this lack of coherent addressing was a factor in the Japanese push to innovate with “location technology,” the tools that put GPS in your phone, link your phone to GoogleMaps, give you maps of the nearest shops on your phone while you drive in your GPS-directed car. I wonder, do they have a huge junk mail marketing industry (the polite term is direct mail marketing) in Japan? How can they? It depends on drawing up lists of addresses by areas that are designated on a map. Now it’s all done with computers, GIS (my gig), but it used to be done with paper lists. They must have to compile, by hand, all the addresses that are in a given area! In New York, even before computers, a bit of research would give you the low and high numbers on streets in your area, and you could fill in the rest-even on one side, odd on the other. As property tax maps have been an instrument critical to the growth of the central state’s power (William the Conquerer did a property survey, pronto, after taking over England. It’s called the DomesdayBook of 1086) the regular postal address sytem has been crucial to the growth of consumerism. Makes shipping the stuff easier, and makes shipping that junk mail easy as can be! We know where you are!